A few months ago, I came across a post in a Facebook support group that really moved me. It was written by a young woman who has Sensory Processing Dysfunction (SPD). She praised and encouraged the stressed out, besides-themselves-with-worry parents who often use the forum to ask questions, vent frustrations, and just seek support for their sensory kid. I’m sure she didn’t realize what a comfort she would be offering these parents when she wrote it. She just wanted to tell them that they were doing a great job and that her parents had been the ones to help her to with coping with SPD. The responses from the parents; however, were amazing. They seemed to cling to the hope that they were doing the right thing for their child and that their child would be okay despite the day to day struggles that they were dealing with. As I read the comments that started pouring in for this woman, I was struck by the fact that these parents were so grateful. They were grateful for the praise and the support from a young woman who had been through all of these day to day struggles and survived. Not just survived but prevailed. 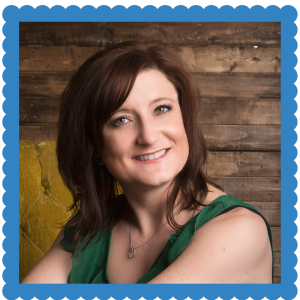 I reached out to Abby to ask her to write a guest post for my website. What she has written is one of the most moving and inspiring stories I’ve ever read. For a young woman of 17 years, she is wise beyond her years. Her story is a touching tribute to what it really feels like to have Sensory Processing Dysfunction. Thank you, Abby for sharing this personal story. 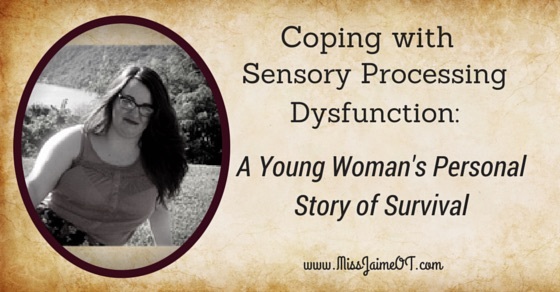 Disclaimer: This post is a personal story written by a young woman with Sensory Processing Dysfunction. This is not meant to imply that you or your child will experience these struggles. Sensory Processing Dysfunction affects people in many different ways. Please contact your physician for more information or go to http://www.spdfoundation.net/about-sensory-processing-disorder/ to learn more. It’s no secret that adolescence is a difficult time for most people, and the same is true for myself. My story is not meant to invoke pity or awe, I am nothing extraordinary and I know that. I have had a life much better than some, and much worse than others. My experiences have shaped me into the young woman I have become, and I wouldn’t change them for anything, despite having nearly not made it out of a few hardships. Most anyone who knows me knows I’m not like the people around me in a few particular ways. My entire life I’ve been called the drama queen, and it’s true. I’m passionate to a fault, I feel incredibly too much, and sometimes I have to hide from the world in order to feel okay again. I’m sure my quirks are somewhat just part of my personality, but what very few people know about me is that at times I genuinely cannot control my emotions or reactions. It’s not just an “Abby thing,” as my friends would put it. It’s a medical condition not many know of. The first time I heard the words “Sensory Integration Dysfunction” I must have been six years old, or thereabouts. It was always just something I’d been diagnosed with as a child, I paid no mind to it, never connected my little quirks with an actual diagnosis. My parents, however, understood that wearing my socks inside out or my abnormally intense tantrums weren’t just who I was, it was this obscure disorder I had. From an early age they knew I was different. I’m sure they knew I’d struggle more than an average child, and I did. I don’t remember my childhood as vividly as they do, for obvious reasons, but I remember being affected by Sensory Processing Disorder; then called Sensory Integration Dysfunction. I used to be late to school because I would throw fits over my shoes feeling too tight, or my undergarments feeling itchy, as embarrassing as that is. I spent my childhood as a relatively happy child when at home, despite the itchy socks. School, however, was never good for me. Academically I suppose I’ve always been above average, not to toot my own horn, but socially school was always a necessary evil. Throughout elementary school I was bullied, for various reasons, but one in particular I remember relating directly with SPD. As a child, up until I was about ten or so, I never wore jeans. I always wore skirts or dresses, specifically because jeans set my nerves on edge for whatever reason. Tight clothing, in general, was never my friend as a child. Anyway, apparently my never wearing jeans bothered some of the kids I went to school with and suddenly I was the new form of entertainment. It wasn’t all bad, I had a few friends here and there, but they always seemed to be very abusive friends. Never respectful or just nice, it always seemed that I had done something wrong. Little did they know, I honest to God could not help the things they found so odd about me. Fast-forward a few years and a lot of awkward, puberty related incidents, and I was finally entering high school. Freshman and sophomore year were probably the most difficult years of my short life, and not for the normal, teenage reasons. Along with being diagnosed with depression and anxiety, as well as the SPD, I was faced with entering an entirely new territory. Genius that I am, I also chose this time to come out to my friends and family, and consequently the entirety of the town, apparently. Small towns, huh? Right, so; incoming freshman, queer kid, depressed, anxious, and scared out of my wits. Great way to start high school. Long story short, it didn’t go well. As stressed and alone that I felt, I started a very bad habit. I turned to self-harm as a form of escape, per se. I fully believe that my struggle with this habit, addiction really, is directly related to Sensory Processing Disorder. 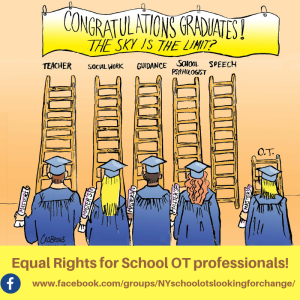 That’s not to say that all kids with SPD are going to turn to something like this, of course not. I suppose it was just my incredibly unhealthy way of coping with my senses, both mental and physical, being entirely too stimulated. Unfortunately, after some time, the depression and self-harm led to multiple suicide attempts. I won’t get into the details, because they’re not something I’d like to relive, nor something I believe anyone would like to hear. What I will say is that even the most recent suicide attempt relates to my diagnosis. It’s surely known in this community that the effects of SPD are not only physical, but emotional as well. For me, the emotional aspect probably affects me most seriously. When I love, I love so much it’s almost too much. When my heart breaks, it can seem like the end of the world if I don’t regulate what I’m feeling. At this point in my life I did not know how to control my emotions, what I was feeling the night I made the decision to end my life was very real and very intense. My entire life my emotions have always seemed too much, as if they were a burden. I have felt many emotions very intensely, but I can honestly say the night I made this decision was the worst instance in which I have ever been overcome with emotion. If you don’t struggle personally with SPD, or maybe you aren’t affected by the emotional aspect, imagine the worst emotional pain you have ever felt. Now, imagine sitting in a dark room with that emotion for hours letting it eat away at you. Now, imagine that multiplied by ten. That’s what I was feeling that night. Thankfully, I was found and taken to a hospital before my heart stopped. Two years after my last suicide attempt and a week spent in an inpatient facility, I am the healthiest and happiest I have ever been. Thanks to multiple forms of therapy and an incredible support system, I am two years self-harm free. I’ve learned to control my emotions, more or less, and I now know how to handle it when my SPD acts up. As weird as it is, I never actually made a conscious connection to SPD and my previous hardships until very recently. A few months ago, I took to the internet and decided to search SPD and it’s connection to the diagnoses I had as well as my struggle with self-harm. The internet isn’t the best resource obviously, but after a lot of research I found multiple connections to so many of the things I’ve struggled with. I found articles about how SPD can truly affect my emotions, how it can be connected to self-harm through stimulation, how many other people with SPD also struggle with depression. I can’t begin to explain how excited I was, I’ll admit to even shedding a few tears. It was like after so long of feeling misunderstood and wrong, it all made sense. Maybe all the things people thought were just “Abby things” were things I really couldn’t help. After all of this self discovery though, I realized there was something else missing. It came to mind that I had never once talked to another person with Sensory Processing Disorder, which kind of sucked, honestly. So, I took to the internet again. More specifically, facebook, and I found a group for people with Sensory Processing Disorder. Reading through the posts was a feeling like no other, seeing other people dealing with the same things I thought were just quirks was incredible. 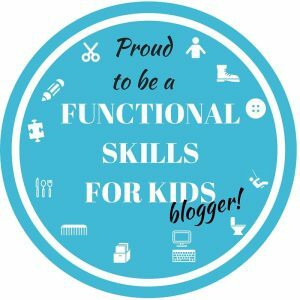 So, I decided to make a post praising and encouraging all the parents on the page trying their best to help children going through a lot of the stuff I did. The response was extraordinary, my mom and I read through the wonderful comments with tears in our eyes. I think the most important thing I’ve learned throughout this crazy journey, though, is this: no matter what you’re going through, no matter how alone you feel, and no matter how much you feel like giving up there is always someone out there who understands and wants to help you. I spent so many years thinking there was something wrong with me and feeling like it would never get better, I can’t tell you how many times I’ve wished I just couldn’t feel anymore. Now, though, I know who I am. I know that SPD is a part of me and it always will be, and even if it feels like a burden sometimes, it’s part of what makes me unique. I may feel too intensely, but that makes me passionate, it makes anyone who receives my love incredibly lucky. I may seem too much to handle to the wrong people, but to the right people I am so important. I may not be able to wear those shoes I liked or that dress I wanted because they don’t feel right on my body, but there are other shoes and dresses. For every burden it seems that comes with this diagnosis there is always a gain, and I hope that if anything comes from my life, it’s that I’m remembered as someone who could always find an upside in the face of adversity. Most of all, I hope whoever is reading this can realize how incredibly special they are. This disorder is not an easy one to face. I’m sure there are many more obstacles to come my way, but I am better because of the challenges I’ve faced and I promise you that you will be too. Abigail Ralstin is a 17 year old student in Indiana. She has grown up with SPD and continues to educate herself on her diagnosis as often as possible. Abigail will start her senior year of high school in the fall and hopes to attend Ball State University in the fall of 2016. She plans to study Zoology and hopes to work at a wildlife rehabilitation center in the future. Along with her studies, Abigail plans to continue to write about her own experiences as she moves forward in her life. Abigail owes much of her success in overcoming her hardships to her wonderful parents, Tammy and Danny, and an incredible support system through her friends and family. 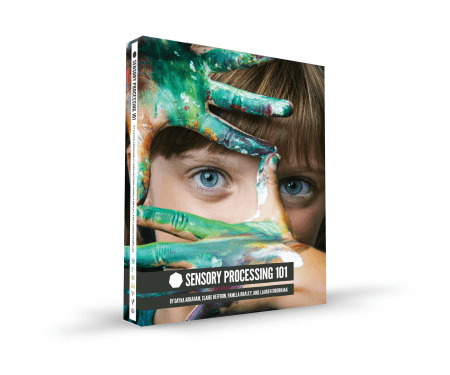 Sensory Processing 101 is a vital resource for parents, therapists, and teachers who work with children with Sensory Difficulties. Abigail is my amazing little sister. Unfortunately, I wasn’t a strong presence in her life during her darkest, most difficult hour, but I’m trying to be a stronger presence now. Words simply cannot express the pride I feel when I think about how far this girl (who people once mistakes as my own child because of our 15 year age difference) has come. And she didn’t stop with just getting herself in a good place. She continues to share her story, educate herself, and most importantly, encourage others! She truly is an inspiration! I love you little seester! Lynn, You are right! I asked her to post for me because of her amazing way with words. She truly is an inspiration! Hi I am 21 and I have SPD – I write. 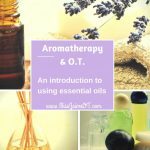 A blog called 21andsensory.wordpress.com that documents my experience with SPD and how I cope with it. I found this post interesting to read and nice to know that other people around my age are coping too! Hi Emily! Thanks for writing! I can’t wait to check out your blog! Thanks for writing in! Lucy Jane Miller had it right! You are “sensational” people! Meghan, Thank you so much for sharing your feelings. I can’t imagine what you are going through – I hope that finding this post and realizing that you are not “alone” can be a beginning of a new way of life. 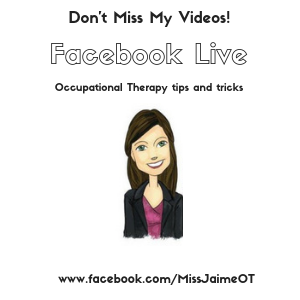 I strongly suggest going to your Dr. and asking for a referral to an Occupational Therapist as well as a psychologist that specializes in SPD. They can support you and help you understand how to help yourself through this tough time. You have special gifts that the world needs to see!